Tags: History PMSS summary 1938-1939, staff, events, reports, number of students, gifts, articles, marriages, performances, publications, construction & remodeling, trips, religious life. Rachel Rowland, Itinerant Home Economics Tchr. PMSS chosen by U. S. Office of Education for a study of interesting curricula of 12 schools. 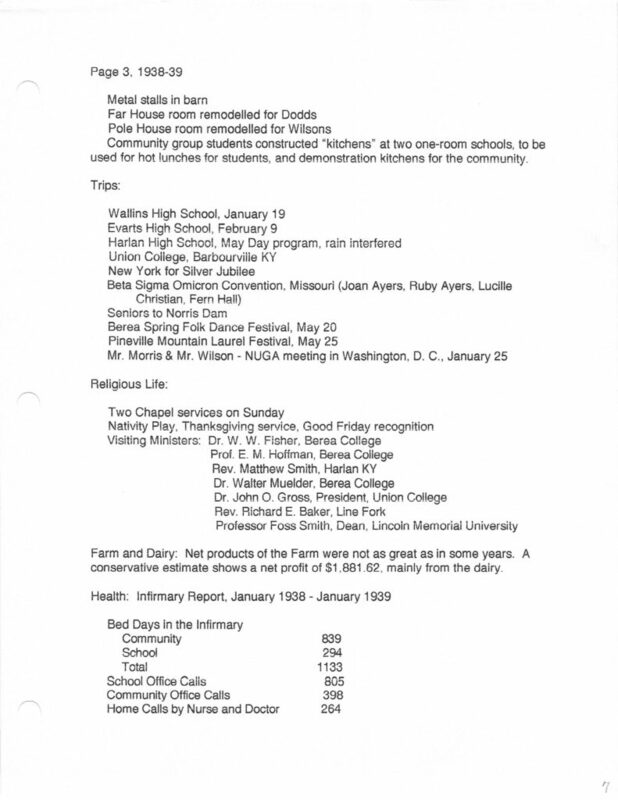 Accounts of various aspects of the school’s program appeared in the Kentucky Educational Journal, Mountain Life & Work, The Curriculum Journal & the Smith College Alumni Association magazine. PMSS selected as one of 216 schools to take part in the Cooperative Study of Secondary School Standards. Participated in Alliance for Guidance of Rural Youth Conference Washington, D. C.
PMSS hosted annual Young People’s Conference sponsored by the Presbyterian Church, USA. Arthur Dodd (Business Manager) and Georgia Ayers (Infirmary Assistant) were married in the Chapel in August and moved to Far House, Everett Wilson, Principal, and Elizabeth Owen, who became PMSS Librarian, were married in the Chapel in August, and moved to Pole House. 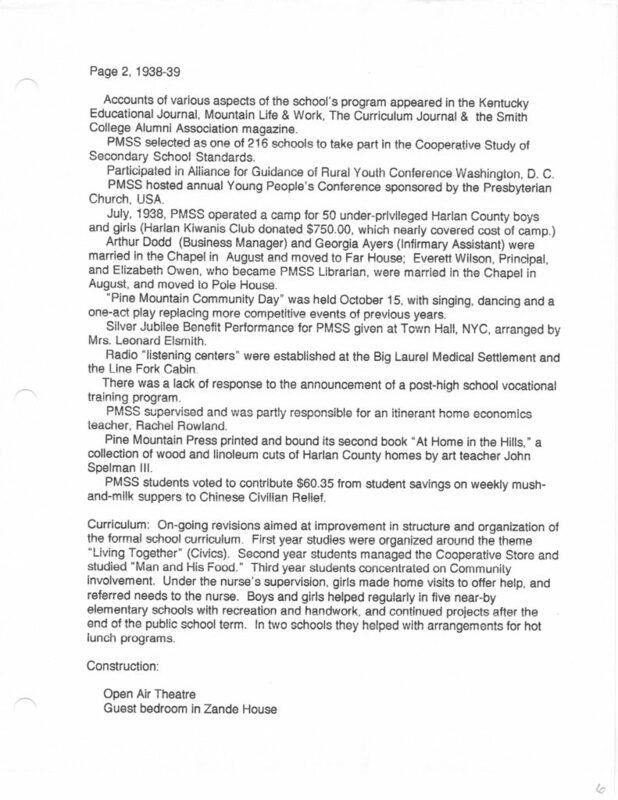 “Pine Mountain Community Day” was held October 15, with singing, dancing and a one-act play replacing more competitive events of previous years. Silver Jubilee Benefit Performance for PMSS given at Town Hall, NYC, arranged by Mrs. Leonard Elsmith. Radio “listening centers” were established at the Big Laurel Medical Settlement and the Line Fork Cabin. There was a lack of response to the announcement of a post-high school vocational training program. 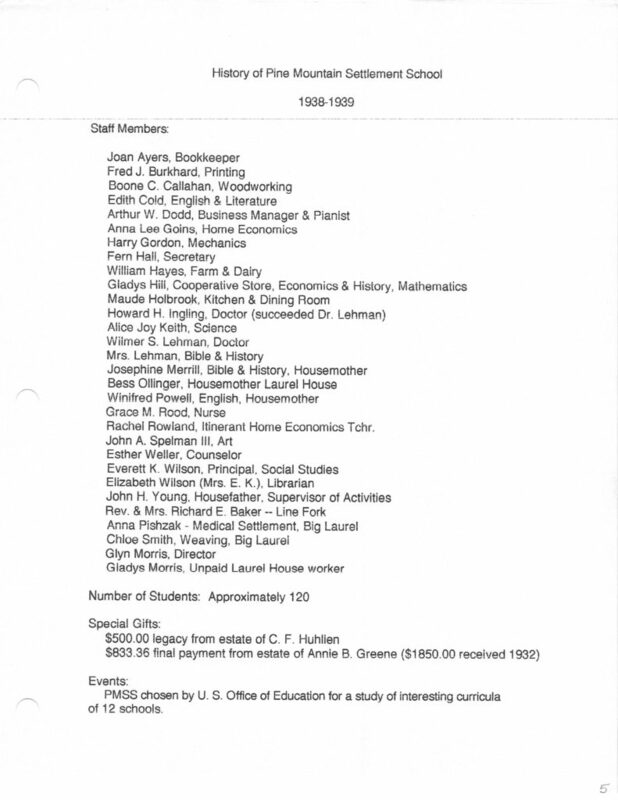 PMSS supervised and was partly responsible for an itinerant home economics teacher, Rachel Rowland. Pine Mountain Press printed and bound its second book “At Home in the Hills,” a collection of wood and linoleum cuts of Harlan County h-omes by art teacher John Spelman III. PMSS students voted to contribute $60.35 from student savings on weekly mush-and-milk suppers to Chinese Civilian Relief. Curriculum: On-going revisions aimed at improvement in structure and organization of the formal school curriculum. First year studies were organized around the theme “Living Together” (Civics). Second year students managed the Cooperative Store and studied “Man and His Food.” Third year students concentrated on Community involvement. Under the nurse’s supervision, girls made home visits to offer help, and referred needs to the nurse. Boys and girls helped regularly in five near-by elementary schools with recreation and handwork, and continued projects after the end of the public school term. In two schools they helped with arrangements for hot lunch programs. Community group students constructed “kitchens” at two one-room schools, to be used for hot lunches for students, and demonstration kitchens for the community. Farm and Dairy: Net products of the Farm were not as great as in some years. 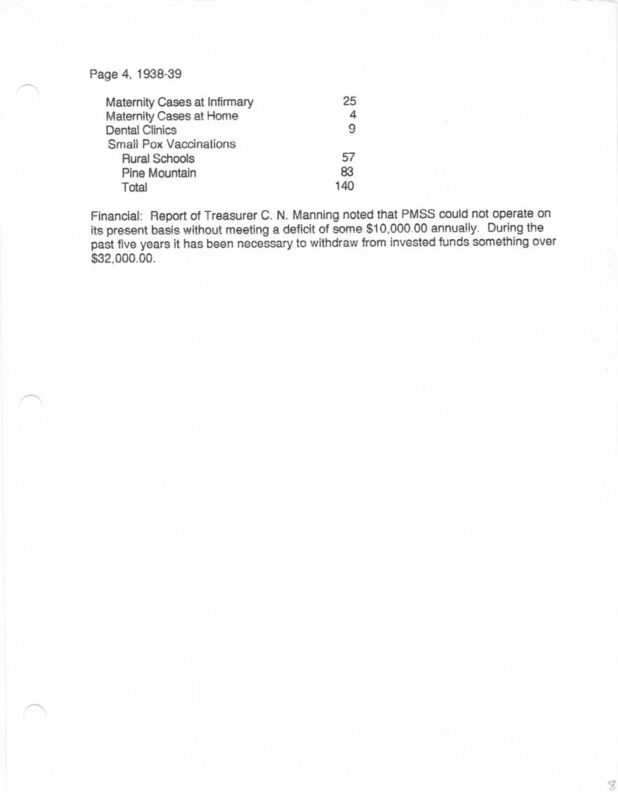 A conservative estimate shows a net profit of $1,881.62, mainly from the dairy.